If you work as a consultant or with a consultant or just need to get something done you will need to decide exactly what it is you need to do. 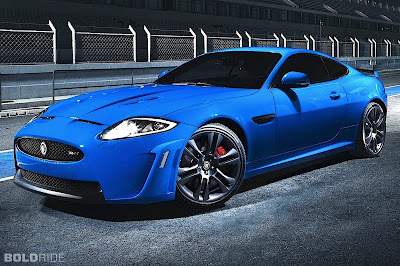 This is called a want or need. In the business world we like to take emotions (yucky distracting things that they are) out of things so we call it a business requirement. Unfortunately the brain is a super computer that works so fast at a subconscious level that most of the time we don't even realise what it's doing for us (or to us). We intuitively leap from problem to solution in one step and state our problems in terms of solutions. "I need a car!" is not a statement of requirement but a solution to an assumed and unstated need, want or business requirement. Compound enough requirements like this when you are trying to build a solution to a complex set of business issues and you drive into a thought cul de sac with no way out because you have already assumed the set of solutions to your problems without having uncovered your real requirements. Only when you consider your requirements as a complete set, stated as either required capabilities or outcomes, can you develop the best possible solutions for your particular problems. Once you have drawn out all the capabilities required and outcomes to be achieved by a particular business process or function you can then design the solution to fulfil the requirements and apply the constraints of circumstance to refine it to something you can actually implement. Part 5 of a series on the 12 Principles of High Performance Warehousing. The eBook can be downloaded for free by joining the High Performance Warehouse Network on the Logistics Help website. Note each new blog post also adds new content with a rewrite of each section so the eBook continually evolves. If you have an old version it might be worth updating it to get the latest version. The principles of process design dictate that the design of systems and infrastructure must support the business process. So in order to get the layout correct you must first design the process that you want it to support - with full knowledge of what is possible and what is affordable. This is the approach we take to all our warehouse designs – first the process then the layout and systems to support it appropriate to the size and growth path of the business. Many people make the mistake of starting with the current system and the existing infrastructure and then designing a process around that. Unfortunately when you do it this way, you are accepting your current limitations without question and missing the opportunity to unleash greater overall productivity in your business. What often starts as a need for some new racking, or an observation that you are running out of space in your warehouse can be an opportunity for a major reform and productivity gain if you open your eyes to what is possible. Do not make the mistake of thinking “I have no budget so I will stick with what I have”. Far better to develop the ideal process and then work out how to fit it to your budget, than compromise the process design by taking your current infrastructure and systems limitations as an unchangeable given. If your current warehouse layout is poor then you have locked in poor productivity into your operations. What’s worse is that this lower productivity is invisible to you because it is not in your front of mind when considering how to improve your operation. Businesses change over time, a once perfectly suitable layout and racking arrangement can become a drain on productivity. Perhaps the layout was never planned in the first place but racking was simply put wherever it fitted at the time the installer showed up. There are two ways of arranging racking & shelving (transverse or longitudinal to the main axis of your warehouse). Unless the floor area allocated to the racking is square, one way will yield more storage locations than the other. This is easily determined by laying out the racking both ways on building plan. This can be easily done with CAD software or a manual drawing. If there is a choice then the longitudinal arrangement will be the more efficient and flexible arrangement due to the greater number of travel aisles leading to the despatch dock. Where racking types are mixed (say block stack, pallet racking and shelving) then assess the average pick frequency for each storage block and layout with the most frequently accessed storage nearest the front of the warehouse. Physical building constraints may still override the optimum positions. The aim is to get the best position possible. Staging areas must be large enough to stage the expected inbound and outbound delivery requirements and preferably next to separate receiving and shipping doors. If operational timing permits, (i.e. receive in the morning and despatch in the afternoon) then the staging space can be shared between receiving and shipping. Build travel shortcut aisles into long runs of racking or shelving so pickers can cut across aisles to reduce travel path. Pallet racking should be continuous with beams removed in one rack bay to a sufficient height to let your forklifts travel underneath the higher levels. Maximise the use of the building volume with high level pallet racking, multi-level shelving modules and mezzanine levels. Generally you can stack stock to up to 45cm below the level of your sprinkler heads but check with your fire system provider for the clearance required for your particular installation. Eliminate air – your stock does not need to breathe! When I walk into a warehouse, one of the first things I look for is storage density as indicated by the amount of free space (air) around products in the storage racking. Lots of air means lots of wasted space which means higher storage cost per unit, longer travel path for put-away and picking and lower productivity. Once you realise that an investment in the most appropriate racking and storage systems for your products is an offset of both rent and operating expense you will not quibble over the cost anymore. Good racking and storage systems make you money, last indefinitely and are never superseded. Is any other investment this good? Buy good quality second hand if your budget is tight. Do not buy cheap damaged racking or inferior quality imports that fit together poorly and that you will not be able to buy more of if you need to add beams or extend your racking in future. This is a false economy and you will regret the decision. Old but quality racking is fine. Old racking was built with a lot more steel in it than modern racking and provided it is not damaged, will last forever. Build optimised workstations for receiving, packing and despatching orders near the inbound and outbound docks. Too much focus just on the pick process and neglecting the whole of the warehouse operations will see you missing out on valuable productivity gains. Slow receiving will starve the picking operations and make them less efficient. However your stock comes in or goes out, you need space and efficient process to get it into or out of the warehouse. This means a well laid out operations bench which is kept clear of junk and has everything you need to hand such as labels, packing materials, paperwork, computer workstation (if required) & printers. Allow sufficient staging space for inbound and outbound order staging and processing. Around the workstations and at each dock you need clearance for staging of product in and out. Nothing kills productivity and throughput rates faster than the double handling caused by inadequate staging space. I have seen warehouses with insufficient staging areas fill up their racking aisles with outbound or inbound stock. When they had to pick or put-away to these aisles they had to double, triple, quadruple handle this stock just to keep functioning. Keep fast moving product in the fastest to access areas. The corollary also applies, put slow moving items in the slowest to access storage areas. If you have a bad building with pillars and walls in all the wrong places then this idea is what will bring back the productivity into your operations. Many businesses simply do not apply this principle to their warehouses or do not apply it rigorously enough to get the full benefit. Use fixed pick locations near to the despatch dock with a periodic replenishment cycle. This keeps fast moving products close together to reduce travel path. This requirement must be balanced by the need to allow sufficient access to the pick face so that all of the orders for fast moving product may be picked. Too close together and you can create congestion as too many pickers need to access the same product at the same time. Store the balance of fast moving stock in randomly located bulk storage racks. 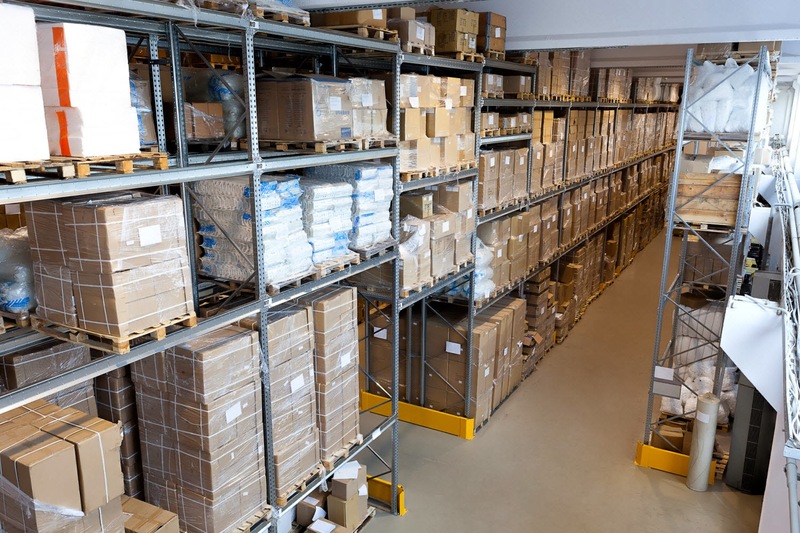 As per point 1: in bulk storage racks, keep the faster moving products in the fastest to access locations, which, in pallet racking, will be low and nearest to the despatch dock. These subsets of bulk storage racking are also referred to as zones. Zoning at this level requires a warehouse management system to control the put-away process. Points 9-11 are related to the idea that is commonly called product slotting. They are important to layout because they will impact what type of racking you put in your fast zone. We will talk more about slotting in principle 7 below. These principles of good warehouse layout must be applied as part of the overall operational process design. This includes the warehouse management system, data collection technology (mobile terminals with barcode scanners, voice directed task technology), racking systems and materials handling equipment. Part 4 of a series on the 12 Principles of High Performance Warehousing. The eBook can be downloaded for free by joining the High Performance Warehouse Network on the Logistics Help website. For each storage system there will be a variety of materials handling equipment options to facilitate storage and picking. 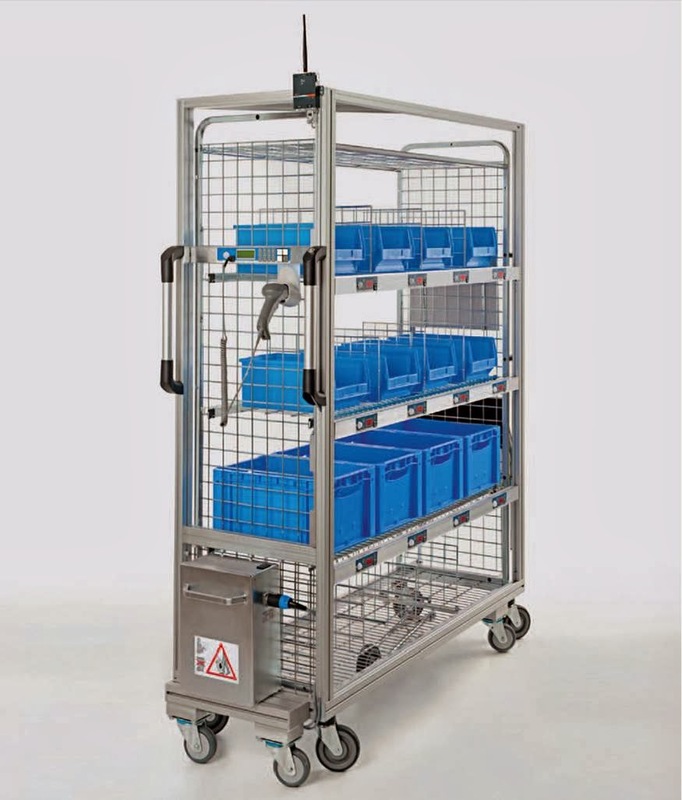 As with the storage system each type or variant of materials handling equipment will also suit a particular variation in inventory and order profile. This section will cover the most commonly used variations in equipment and their applications. The eBook version of this post also includes a pictures and examples for each equipment type not included in this blogpost. Do you have the right equipment for your warehouse? Trolleys for shelving and pedestrian picking. Trolleys are very widely used for picking from shelving and multi-level shelving modules. Conventional two tub trolleys are great for picking large orders of small items. If your order profile swings the opposite way with a high volume of small orders from a large SKU range with only a few unit picks per order (a typical profile of an online direct to consumer business) then your most efficient picking method may be a multi-order picking where multiple orders are picked in one pass through the warehouse. This requires a special configuration that lets you pick into multiple tubs (or cartons or bags) on the trolley to maintain separation between different orders. Motorised trolleys: These come in all shapes and sizes from the pallet jack or ride on order picking trolley with a motor, to the mid-level order pick vehicle like the Crown WAVE. They are more expensive than their manual counterparts but have significant productivity and health and safety benefits. The pallet jack is still a very useful tool for the warehouse. It provides pallet moving and basic case pick to pallet functionality. It is very cheap and suits relatively low order volume use. Past a certain order volume or size of order, manual handling and speed will become an issue and a motorised pallet mover will improve efficiency and reduce manual handling risk. Motorised pallet jacks are useful where the loads being moved are heavy or they are in constant use for order picking. While they are mostly designed for pedestrian use some have fold down platforms for ride on use. Some designs also have a lift mechanism which will lift the pallet higher to reduce back strain when transferring heavy cartons or equipment onto the pallet. When they have a fixed ride on platform and higher performance motors and batteries the motorised pallet jack is commonly referred to as a stock picker. Do not use ladders for order picking in your warehouse. They are slow and unsafe. Instead use a WAVE type motorised man up order picker or similar unit. Whilst the cost of these units may be 100X the cost of a ladder, the savings in productivity and reduced risk of injury makes them a bargain. I cringe every time I walk into a work place and see ladders being used for stock picking. Ladders belong in the maintenance shed not the warehouse. Walkie stacker forklifts are so called because they are operated by a pedestrian rather than being a ride on unit. They come in a wide variety of sizes and can even be fitted to suit double deep pallet racking. They are perfect for smaller warehouses with limited space and low movement volume. They can operate in narrow aisles of just over 2m which allows high storage density to maximise orderly pallet storage in a limited space. Stock picker / mid-level stock picker. These units are designed for fast case picking from pallet racking at floor level, although some units (mid-level stock picker) are made with lifts to allow picking from the second and third level. They can carry up to three pallets on extended tines. This type of machine is the mainstay of the FMCG wholesale and large retail distribution centre. Crown equipment recently introduced a remote controlled unit that allows the operator to move the unit whilst walking along side. This enhances productivity because the operator does not have to step in and out of the vehicle to advance it to the next location within an aisle. 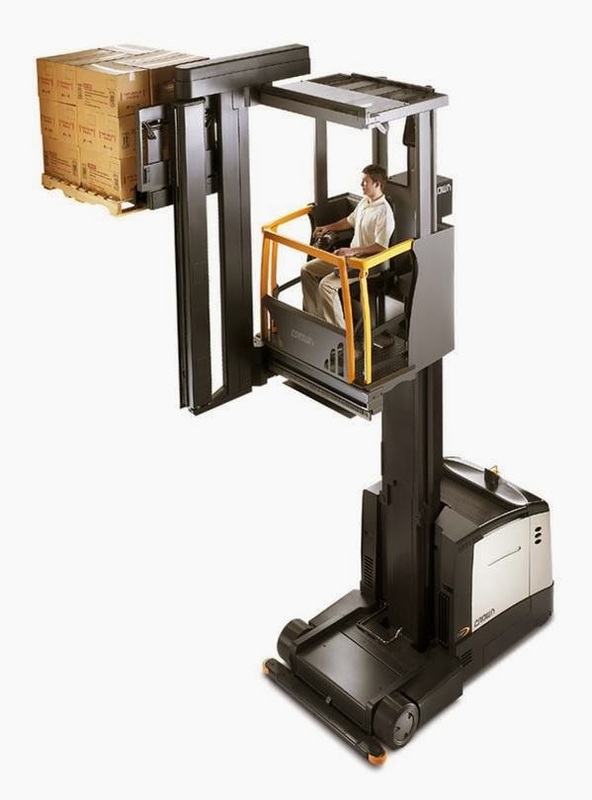 Counterbalanced forklifts are best suited to truck and container loading/unloading and moving stock and materials around in larger open areas outside and open staging areas in warehouses. They have generally been replaced by reach trucks for accessing pallet racking, which operate in narrower aisles and have much higher mast heights. Reach trucks are designed for accessing pallet racking in aisle widths as narrow as 2.8m (pallet to pallet) and rack heights up to ~12m. There are two types; moving mast and fixed mast with pantograph type reach mechanisms. Pantograph mechanisms are generally faster and more capable but both are widely used. Extended pantographs or extendable tines (for moving mast units) are available for accessing double deep racking. The reach truck is the workhorse of the bulky goods warehouse and is good for mixed case picking and pallet movements, replenishing pick faces from bulk reserve storage at higher levels in pallet racking. Man up stock pickers are used for case picking from pallet racking above ground level. They can operate in the same racking as a reach truck or very narrow aisles like a turret truck. They cannot remove pallets from the racks. They are great for case picking a long tail of slower moving SKUs where there are too many items to fit into ground level pick faces. Turret trucks are designed for very narrow aisle pallet racking with heights up to 17m and aisle widths of only 1.8m between pallet faces. High racking and narrow aisles provides for high density storage and is great for when large volumes of stock must be carried either due to a very large SKU range or when the lead times are long and high volumes of stock must be carried. Turret trucks are cheaper and more flexible than a crane systems, but cranes can go even higher. Turret trucks are suitable for bulk movements of full pallets as well as case picking a long tail of slow moving bulky SKUs. Although they can move freely in and out of aisles they are not suitable for use in conventional pallet racking due to the lack of a guidance system. 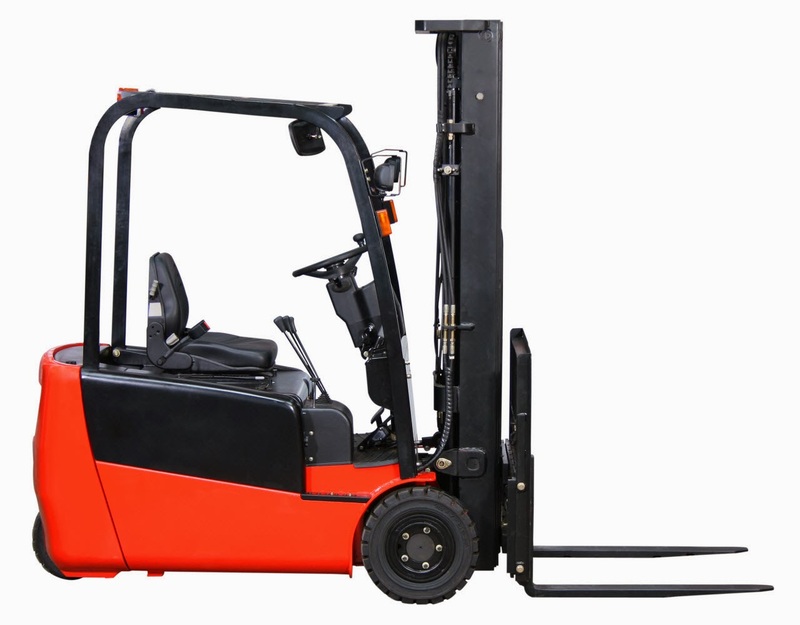 There are a few specialist types of forklifts that are worth mentioning for completeness. Aisle-master: a special type of counterbalanced forklift that pivots the mast to allow it to operate in very narrow 2m wide aisles. In this sense they are like a turret truck but are not man up or as high masted. They are also slower to operate. They are not common but have their place if you need the storage density of very narrow aisle and your pallet movement volume is not too high. They can be combined with a stock picker to provide case picking out of the very narrow aisle racks. Manitou: The Manitou is really a piece of construction/mining/agriculture equipment more than a warehousing tool, but it is a forklift and invaluable for its designed purpose. Container forklift: The container forklift is used for moving containers at Ports and other container handling facilities. Large and specialised they are an essential part of the supply chain. A forklift is also platform for all sorts of specialist attachments to lift and manipulate almost any type of load you can imagine. Here are a few of the more common attachments. Drum handler: used to grab and move 200litre drums. These attachments come in a variety of forms and also include attachments to safely pour from drums and to grab two or more drums at a time. Big box grabber: used to move large flat sided things such as fridges and cable drums that are not stored on pallets. Slip sheet grabber: If you want to save a bundle on your containerised freight then start using slip sheets. Slip sheets allow palletised loads to be loaded into containers without the pallet and easily unloaded and palletised during container unloading. This is much cheaper and faster and safer than hand loading/unloading containers. Crane jib: Turns your forklift into a crane for moving heavy things that are not on a pallet and can be picked up with a hook. Safety cage: Every warehouse with a forklift should have a safety cage. They are invaluable for periodic maintenance tasks such as changing high bay light bulbs (if you haven’t yet converted to LED lighting) and much safer than a big ladder. Pallet stacker cranes: These are usually sophisticated automatic storage and retrieval systems for very high density storage. They can be combined with in rack shuttles for multi-deep storage for high volume bulk inventory. Such installations are rare in Australia but more common in Europe where the limited availability of land and high price of real estate justifies the investment. They can reach up to 50m in height. Tow tractors: The tow tractor is designed to tow a variety of customised trailers configured for a particular application. They are not really a warehousing machine although they could conceivably be used for order picking. However they are widely used for a variety of logistics purposes to move materials and supplies in manufacturing, industrial sites, airports, hospitals and large institutions and other campus based facilities. There are an almost infinite variety of these types of units for any conceivable application. Do you need help with your warehouse? Part 3 of a series on the 12 Principles of High Performance Warehousing. The eBook can be downloaded for free by joining the High Performance Warehouse Network on the Logistics Help website. Your inventory and order profile will derive from the value chain of the market you are serving. For example an online business serving individual customers will usually have many orders selecting from a large range of SKUs with only one or two lines per order and usually small to medium sized items that are easily shipped door to door and internationally. A manufacturer may only make a small range of products (less than 50 SKUs) but ship them in volume to wholesalers and markets around the world. These two extremes demand very different solutions in the warehouse. I have identified two dimensions of inventory profile - (total number of SKUs and size of SKU), and three dimensions of ordering pattern - (order frequency, average lines per order and average units per line). 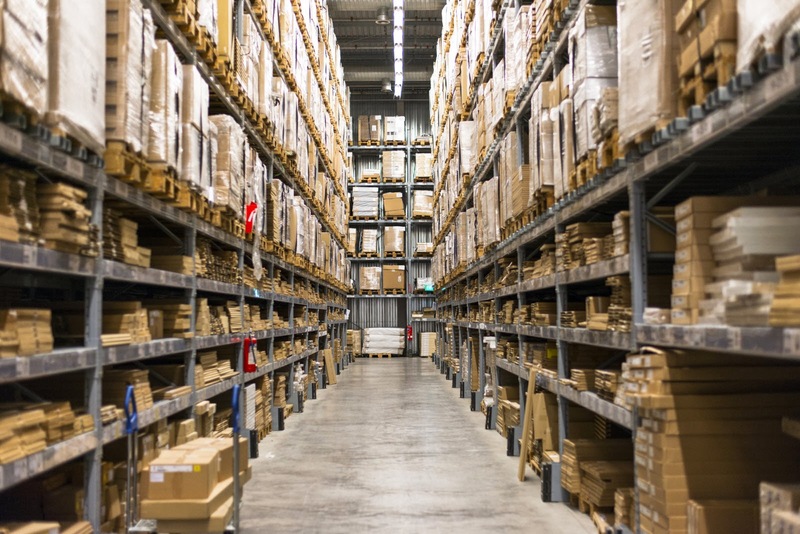 Each different combination of inventory and order dimensions will require a particular storage solution that will provide the best fit for storage density and process productivity in the warehouse. warehousing solutions. It sounds simple but the answer is not always obvious. There is an additional inventory dimension that I have left out for the sake of simplicity. This is storage conditions. Storage conditions requirements are typically temperature (cold chain, cool and frozen for food and pharmaceuticals, security for bonded items or dangerous drugs and high value items like electronics or jewellery and dangerous goods such as flammables, toxic chemicals, corrosives, explosives etc. These are not insignificant factors in the design of warehousing operations but are beyond the scope of this eBook. I will address them in future updates and the extended version of this work. The table below indicates a recommended storage system for each of the thirty two combinations across the five dimensions of inventory and order profile. This is a simplification but will serve as a guide to what you might need when setting up a new business channel you may not be familiar with. The reality is there is a continuum of inventory and order profiles from bulky pallet based activity through to high volume orders for a long tail of small items. There is also a very wide range of racking, shelving and storage equipment that can be configured specifically to suit any conceivable range of product sizes and volume. The detailed selection of a storage system should be considered very carefully to ensure that you get the best fit without sacrificing flexibility to grow or adapt the system as both your inventory profile and order profile changes over time. It is also quite common for a company to have a SKU range that requires different categories of storage systems. So for example the same customers might be ordering full pallet loads of a high volume bulk item as well as case picks of moderately sized items and unit picks from a long tail of small items. In these cases the warehouse will need to be configured in different zones for each different storage system. As the picking methods and equipment will be different then these picks are usually split so that they can be processed separately and then consolidated on the dock for delivery. I have summarised the use of the most commonly used storage systems below. Block stack: (the original storage system!) fast to access storage for bulk quantities of a limited range of SKUs. Fairly dense storage but beaten by drive in racking for maximum space utilisation. Usually configured as Last In First Out (LIFO) access which means that lanes must be emptied before refilling to ensure stock rotation. Drive in racking: Same use as block stack, slightly slower to use due to the need to drive the forklift carefully. Very good storage density. Can be set up as LIFO or FIFO as for block stack if access aisles are provided at each end. Pallet flow & push back racking: pallet shuttle systems: These are also dense storage for bulk palletised stock. They ensure that stock is always at the rack face and so speed access for picking over drive in racking. Push back is LIFO access only. Pallet flow is FIFO only and requires an aisle each end. Shuttle systems can be configured either LIFO or FIFO and are expensive but do provide very dense and fast access bulk storage. Pallet racking (single selective): The near universal warehouse pallet storage solution. Provides good storage density and complete selectivity of each pallet. Allows the height of the building to be used to increase density. Fast to access and very flexible. Normally accessed with a reach type forklift it can also be accessed with a man-up stock picker for fast case picking of a large SKU range. Pallet racking (double deep). Significantly more dense storage than single selective racking above whilst also maintaining good selectivity. Each location holds two pallets of the same item with LIFO access. Good for pallet and case picking of bulk high volume items. Long span shelving: Pallet racking with shelves, this is a good storage method for shelving bulky but slower moving items. Two to three levels can be set up or access by pedestrian pickers for case and item level picking. Good storage density and selectivity. Good for creating a unit or inner picking area for items that are normally case picked out of pallet racking or block stack. Steel shelving: Along with single selective pallet racking steel shelving is the most commonly used warehouse storage system. Available in abundant sizes and shelf configurations and can be obtained very cheaply second hand. Used for storage of small items accessed by pedestrian pickers. Use of carefully matched shelf spacing and dividers within shelves can provide very dense storage. Shelf storage can be stacked as a multi-level pick module of typically 2-3 levels to use the building height and store a large range of SKUs. Carton Live Storage: Good for medium to fast moving items with a wide range of SKUs. Perfect stock rotation with FIFO replenishment from the rear of the unit. Not so good for very high volume items as replenishment will be required too frequently. Often used with Pick To Light systems to speed order picking. Drawer systems: very high density storage for a large range of SKUs with generally low movement frequency. Excellent for spare parts and long tail small items. Fairly expensive but provides good stock protection as items are enclosed in the drawer units. Vertical carousels: The next level up from drawer systems and for a similar purpose. Good storage density if they are tall and use the building height. The main aim of a carousel is that if provides automated goods to the storeperson put-away and picking for highly productive picking of long tail large SKU range such as spare parts. Carousels have their own proprietary control systems that guide the operator through put-away and picking functions. These systems require an interface to a business system or warehouse management system. Need some help to set up your warehouse for high performance? Logistics Help. Simple theme. Powered by Blogger.